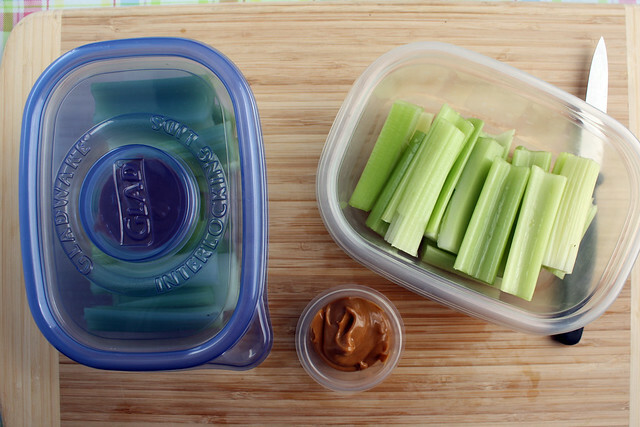 The truth is, packing lunches bento style doesn’t take much more time than packing a brown bag lunch would. Sure, if I’m doing something a little fancier like a decorated cut-out sandwich, a checkered apple or something else along those lines it can add a few minutes — but most of our lunches are pretty basic and putting food in a box usually doesn’t involve much more effort than putting it into a plastic bag. 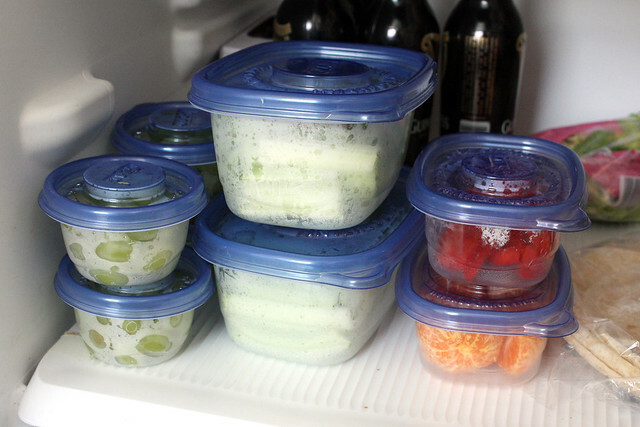 Still, I’m always looking for ways to streamline lunch-packing and mornings in general so the past few weeks I’ve been making an effort to prep the fruits and veggies I buy for our lunches in advance. 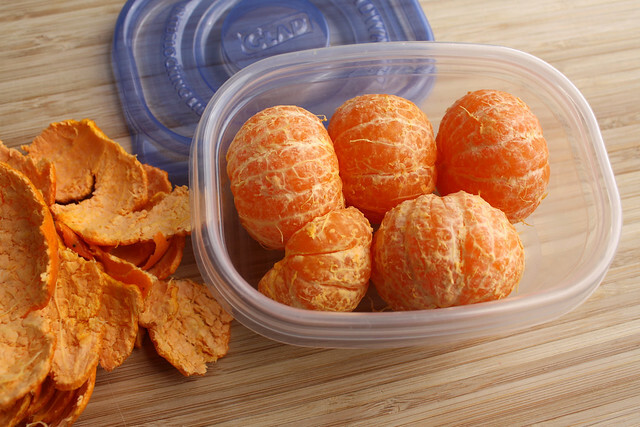 This is not a revolutionary idea and I’m better or worse at it depending on how much I have going on, but when I do manage to consistently cut, chop, peel and pack produce into containers for the fridge I’m always a little surprised by how much of a difference it makes in our lives. Aside from figuring out what to put in the lunch box, cleaning and prepping fruits and vegetables takes the biggest chunk of my time when I’m packing a lunch. Having containers packed with a variety of options helps with both problems because I can choose from the available options and then put the food right in the box. For reals. Lately I’ve been coaching my boys to make better choices when they want a snack but it’s hard for them — especially the 4 year old — to choose produce when they aren’t super skilled at preparing it themselves. And because some items need to be cut or peeled before the kids can eat them they aren’t even an option unless I get involved. Washing and chopping the food in advance removes all barriers. 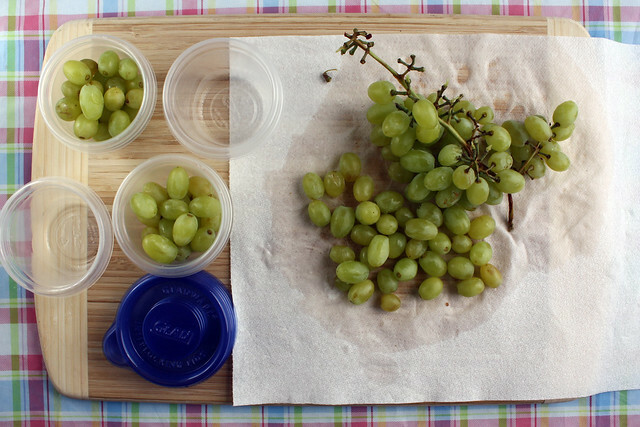 I store the containers on the bottom shelf of the fridge so they’re easy to see and reach and they are actually excited to pick some grapes or celery sticks (especially when I pack it with a small cup of peanut butter for dipping). I’ve alluded to this before in several posts, but I have a few terrible habits related to food. I skip breakfast often and I also tend to get so involved with my work that I forget to eat lunch too. By the time I finally do eat something I’m starving and I will grab crackers or a handful of nuts or something else that I can immediately put in my mouth. Lately I’ve been choosing to snack on my little boxes of fruits and veggies instead. Not only does this keep me from making poor choices related to hunger but I also find that I’m more likely to add fruit to my yogurt or extra veggies to my salad when I do finally get it together to fix myself something. This is obvious: if the veggies are already chopped, dinner prep takes very little time. It also helps to get us out of our frozen peas and corn side dish rut. Instead of being an after-thought that I throw in the microwave when the main dish is almost done cooking, I grab the container of cauliflower florets or sugar snap peas or whatever when I’m pulling all the other ingredients to make the meal out of the fridge and I have a bit more time to do something interesting with them. And yeah — those veggies are still sometimes an after-thought that I throw in the microwave at the last second, but at least they’re not peas and corn! I’m often guilty of forgetting that I have a bag of broccoli or a couple bell peppers in the vegetable crisper, then finding them a couple weeks later all wilted and moldy. Yuck! Or I buy a huge bag of oranges and we start to get sick of them so they languish in the fruit bowl. When I go on my weekly hunt for veggies to prep, I just grab these neglected guys (before they’re gross) and get them ready to eat. They’re magically gone in a few days. Do you prep your produce in advance? How does it make your life better? I’m working with Glad in March and April to bring you lots of tips and recipes for packing lunches on the Glad Mom Made site! Follow Glad on Facebook to stay up-to-date on all of the ideas shared by Glad’s Mom Made Panel.